I got this palette all the way back at Christmas and I was so happy to see it under the tree. There's always so many things I want from Makeup Revolution and the fact they are so cheap is very much a bonus. I, however, haven't bought from them for quite some time, sadly, due to the insane amount of spending (on others may I add) and saving we're currently doing. Hard Day is a mix of earthy toned shades, a couple of bronze/gold tone and purple shades. It's the perfect mix of mattes and shimmers. Inside the Salvation palette are 18 shades, a sponge applicator and a built in mirror. 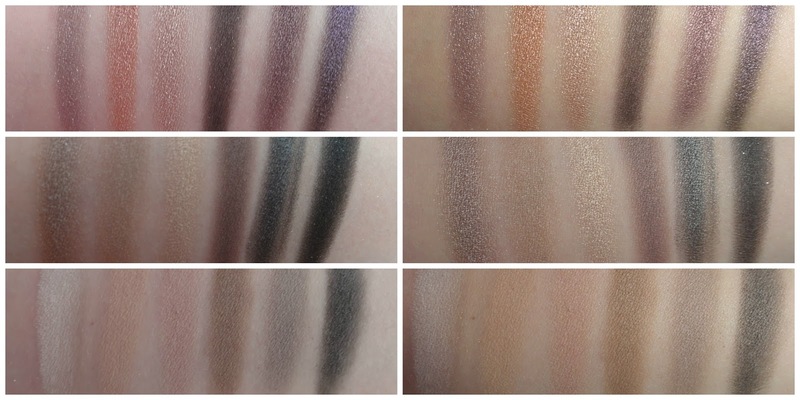 The left hand side of the swatches are taken without flash and the right with flash. First sections are the first row, second sections the second row and last sections the third row. - Click images to enlarge pic. The names of the shades are quite fitting with the name of the palette. Give me a break, gets you into hot water and not one for playing games to name a few. Like always, I'm impressed with the range of shades available and the pigmentation of each one, especially the mattes which I tend not to get on with. This is available to purchase for an impressive £6. Makeup Revolution are turning 1 tomorrow and to celebrate they are giving away £25 worth of makeup on all orders £25 or over. Remember to message them on social media and wish them a Happy 1st Birthday - I think they well and truly deserve it. I want to buy more!! Make up Revolution just seem amazing and do great dupes, but I haven't yet bought anything from them. This palette looks great though, a great variety and a fantastic price. I'm reading so many great reviews about their products lately. Great to see swatches too as lots of blogs just photograph the product. Holy moly, that palette is just gorgeous! The shades all look so lovely and those swatches are incredible. And the price! Amazing.